In case you have been knitting under a rock, Clapotis is an enormously popular internet-based pattern - a scarf/shawl created in a genius way by designer Kate Gilbert. When I first saw this pattern in Knitty I confess to being unimpressed. I don't exactly take to variegated yarn (Kate used Lorna's Laces Lion and Lamb for her prototype), nor to drop stitch patterns, which strike me as a cheap version of lace. There was really nothing I liked about this pattern except the look of the photo with the Frenchified model enjoying un cafe at an outdoor cafe. But fifty million knitters can't be wrong. When I noticed how everyone aclaimed the wonderfulness of this pattern, I took another look. I found myself liking the way the garment could be either a shawl or a scarf, and the offhand way that Kate showed the wrong (purl) side of the fabric. Naturellement, I wound up making one. For my trial I used an inexpensive but nice yarn: Paton's Classic Merino in a peachy variegated colorway called Regency. 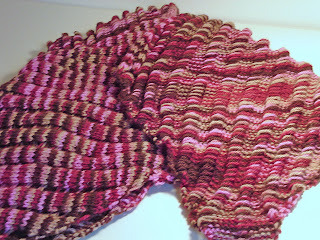 I discovered that unlike many patterns, Clapotis is the perfect medium for variegated yarn. This yarn striped diagonally, so the striped and sometimes pooling effect is nicely broken up by the design. 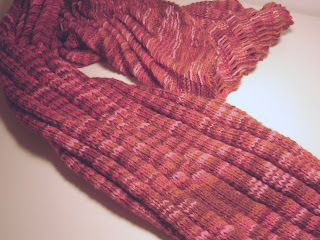 Then I discovered that Clapotis is so cleverly shaped and is such easy, soothing knitting. Then I found that Clapotis is wonderful to wear, warm, cozy, and clinging. Like Kate, I prefer Clap unblocked and scrunchy. It also clings better with the purl side up. I actually wear this every day. And of course, the first time I wore it in public I got more than one enthusiastic compliment. It is a pretty color. So guess what? I am a Clap convert. And I made another one! For mom. Same yarn in the pink and brown colorway called Rosewood. Now the only issue I have left with Clapotis is its chunkiness in worsted weight wool. As is, I love it as a shawl, but as a scarf not so much. That is why I have plans for a third Clapotis in a thinner, slinkier yarn to be more scarfy. I am thinking Knitpicks Shimmer, a laceweight used double. Thank you Knitty and Kate Gilbert. This is a fabulous blog, but I have to say that I think clapotis are weird and are only suitable for elderly deranged individuals. What is the plural of clapotis, anyway? Clapoti? Clapotises? I'm a clapotis convert myself. I had the same thoughts about not being too impressed but it is such a wonderful, soothing pattern to knit. I love it and feel like there will be more in my future. I'm knitting it in Zephyr so it's kind of lacy and light. Thanks for your comment Ninaclock. My next Clapotis will definitely be in a lighter weight yarn. Everytime I wear mine, I get compliments.